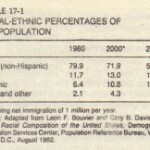 the reasons her party lost the next election,and her successor modified the population program, removing any elements which might regarded as coercive [Borders, 1977]. As stated earlier, the Peoples’ Republic of China has established the world’s most vigorous population control program. The Chinese program had practically every measure tried an y. ‘here else” as well as a few items unique to China. All contraceptive methods are made available, as well as sterilization and abortion. The one-child family is the official ideal, and the recommended ;. minimum age marriage is 28 for males -\ and 25 for females [Kessen, 1975,·p. 21].